Making the most of a traveler's notebook and Illustrated Faith Stamps. 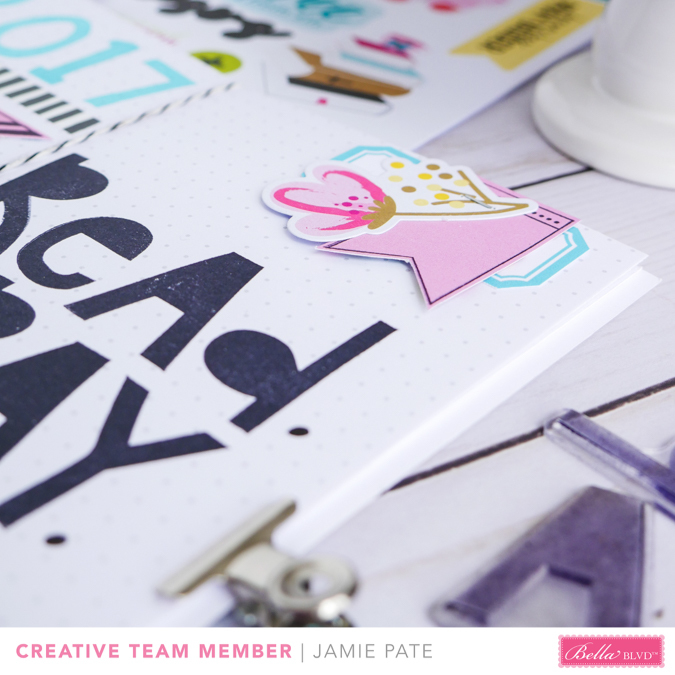 This week at BellaBlvd the creative team has been teaming up with all things stamps. 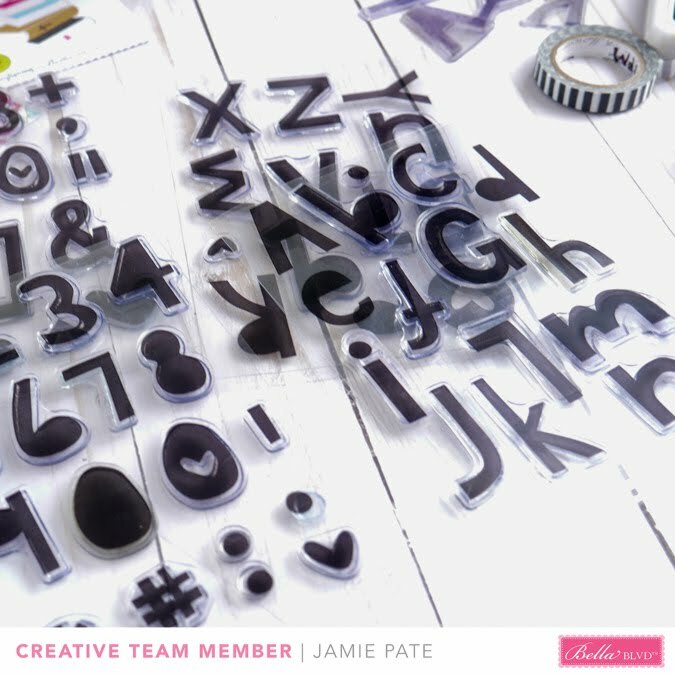 I happily played along as one of my first loves in this paper creative world was/is stamps. 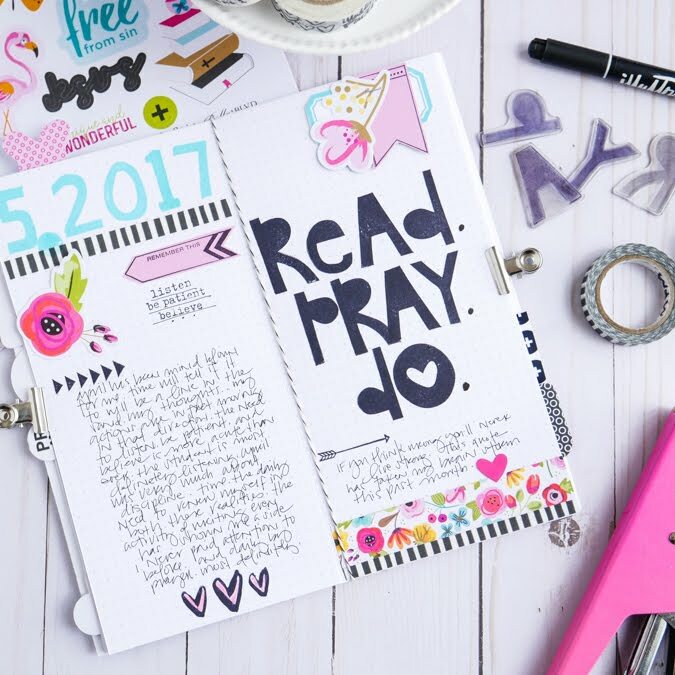 Illustrated Faith has a fabulous collection of stamp options. One set I reach for most often is the Homespun Alpha. It's big and bold, which is not usually my style, but that said, I really love the larger statement these stamps make. Using these stamps in this traveler's notebook, that I use as a prayer journal, helps me to translate some thoughts I was thinking. It's one reason I adore and always seem to rediscover the traveler's. The space is a small commitment. It's super easy to make a big statement. And there is plenty of room for the interpersonal journaling. This particular Traveler's Notebook was created using Bella Blvd and Illustrated Faith and you can find the details right here: New Year Goals Journal. Paper embellishments, stamps, and stickers still find their way on my traveler's pages. Adding a few embellishments that give way to a bit of creative therapy all the while having a space for heart issues absolutely does something for my heart and soul. This is needful for me. I need only be in a better habit of this creative play. Starting with this past month, I did just that. Used this handmade traveler's to be home to some prayerful heart issues. Looking forward to filling these pages up this month, and then starting a new one next month. I loved this exercise so much. I loved the challenge of stamps week at Bella. I loved adding my bits and pieces right here. 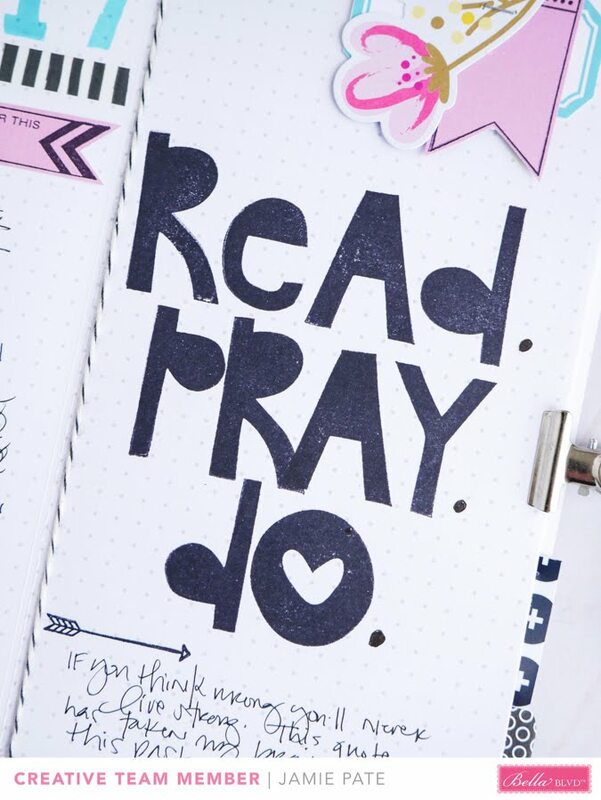 I love the comfort prayer brings me, and the creativity this traveler's notebook provides. 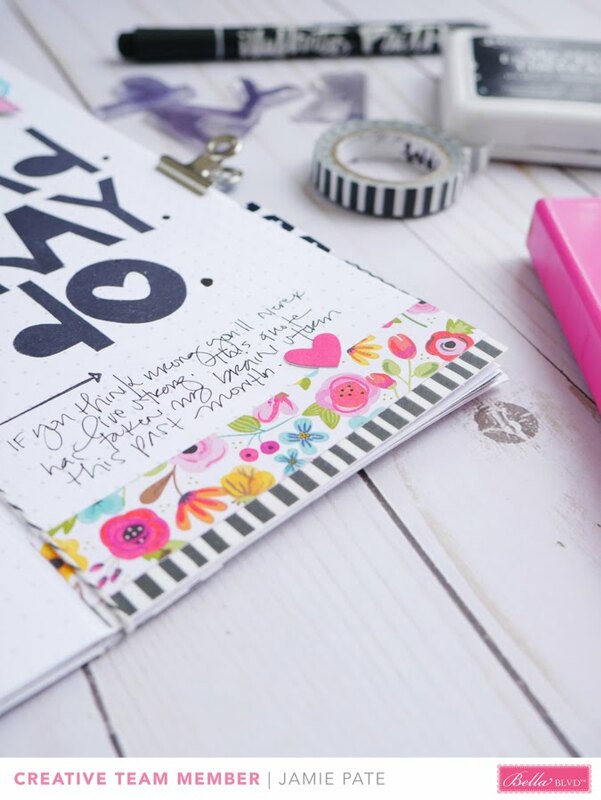 supplies | Illustrated Faith: Clear Stamps: Homespun Alpha, Homespun Numbers, You Are Loved, Icons. 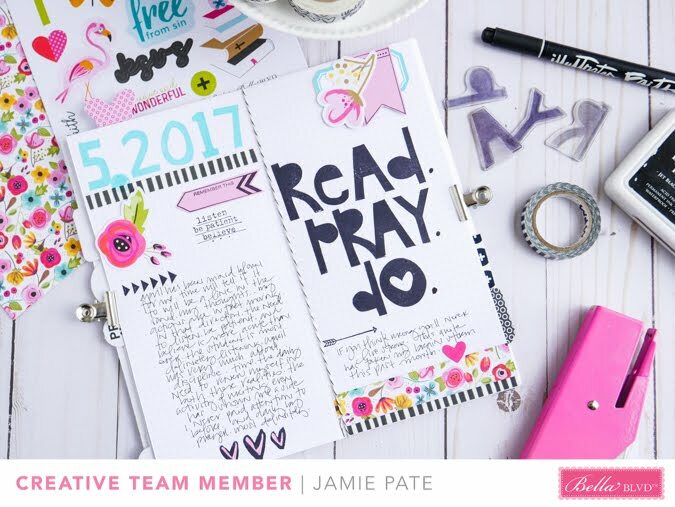 Illustrated Faith Basics Paper Pad. Everyday Icons Cardstock Stickers. This is a personal blog. All editorial content and projects are intellectual property of jamiepate.com I do receive financial compensation and material product from BellaBlvd to develop my craft posts, but all ideas and opinions are my own.